Does having money always seem to be problem for you? Do you find yourself knee deep in debt, spending your days avoiding calls from collection agencies who are threatening to sue the pants off of you? Does it seem that even when you have a little bit of money, it just disappears almost instantly and you have no idea where it went? Do you often wonder how other people seem to just generate money without even trying while you spend your days working hard, thinking of ways to make a little extra cash only to always remain broke? The good news is that I have been there and I can help you. After all, how do you think I am able to ask the questions that directly relate to the way you feel about money (and not having any)? It’s because I have been in the exact same situation, thousands and thousands of times throughout my life; even at times where I was making over 100k per year! My name is Paul Mascetta; formerly known as “Spend it all Paul”. And no that’s not a joke; people really used to call me that. Here’s why; from as far back as I could remember, I never had any money in my pocket. Savings was not even something I could fathom. Even when I was in my early 20’s making a decent living, I was always broke. In fact, at times my account was so overdrawn that by the time my next paycheck was deposited into my account, it was almost instantly eaten up. Knowing that electronic funds transfers done online sometimes take a day or so to complete, I actually made a “fake” payment to my cable company using my routing number and checking account number so my service would be restored because my nephew liked to watch certain cartoons that were only on cable. But the truth is, it had nothing to with any of that. Sure, more money is always good but it’s what you do with your money that’s more important. And all I did with it was spend it recklessly. And getting my hands on more would only cause me to keep spending it. And in the process, my health and relationships were deteriorating because I was stresses, frustrated and downright scared. I was trying to solve an internal problem using external resources. That formula never works. That’s when I decided that I needed the help of an expert that could help me reprogram my mind to make decisions and take actions that would enrich my life rather than rob it of joy and money. 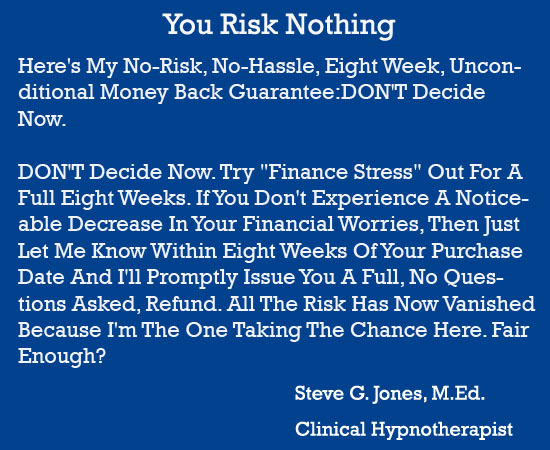 His name is Steve G. Jones, Clinical Hypnotherapist and when it comes to improving life through lasting positive change using the power of hypnotic influence, he is the “go to” guy. Using the same principles and techniques that he used to help me reconstruct my entire financial life, Steve has now created an empowering resource that anyone can use. You will be able to do the exact same thing only without having to fly to his office in Savannah, Georgia for a private session, which now costs $25,000. If you are finally ready to stop worrying about the money that you never seem to have; take action now and change your life! For just $27.97, you can recreate a reality where stress about money and finances no longer have the ability to rob you of the joy you so rightly deserve! 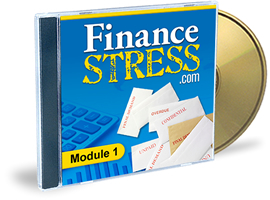 "Finance Stress" Consists of Four Empowering Audio Modules, which are approximately 30 minutes each in length. 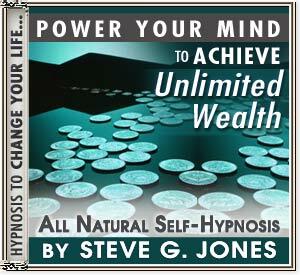 Hypnotherapy will help you achieve unlimited wealth in your life. This powerful hypnosis session will target your subconscious mind to no longer block you from gaining wealth in your life. You are a wealthy person. Now you just have to tap into your ability to achieve unlimited wealth. Using this self-hypnosis program will open up your world to new and unbelievable opportunities. Hypnosis puts you in charge of your future and gives you the ability to accumulate unlimited wealth. We suggest you listen to this hypnosis session for 21 nights in a row as you go to bed at night. You will begin to see changes in your life in as soon as the first session! After 21 nights, you will be well on your way to achieving unlimited wealth!